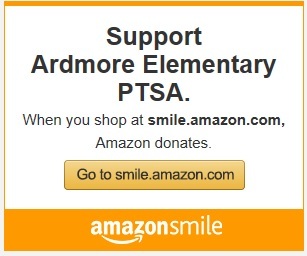 Ardmore Elementary PTSA - Walk to School October 8th! Walk to School October 8th! October 8th is International Walk to School Day! Lace up your walking shoes, put on your Seahawk colors, and walk to school with Ardmore! Join the Fun and Walk to school with the Seahawks Mascot Blitz as well as a special International Walk to School Mascot “PedBee”! Walk your usual route to school – easy! Join our Walking School Bus! 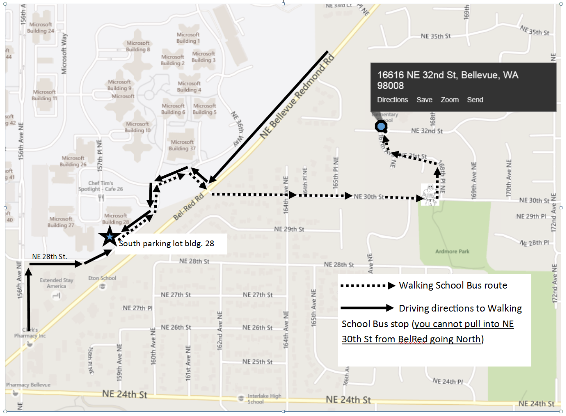 Parents drive to our starting parking location, Microsoft Bldg 28 parking lot (map below) and walk in with your child. Families will join in along the route. We will be departing from the parking lot location at 7:30am sharp! Blitz will join our walking school bus along the way! Walk from your house to your regular school bus pick up location! Why Walk? A ticket for the raffle of a basket full of goodies! The class that has highest percentage of walkers will receive a free Seahawks T-shirt! The Seahawk Fan Challenge! If Ardmore has at least 100 walkers, Mr. Miller, Dallas Cowboy fan & Mr. Jones, Chicago Bears fan, will have to wear a Seahawks shirt on EVERY FRIDAY for a MONTH!!!! This could be particularly hard for Mr. Miller on Friday October 10th as the Seahawks play the Dallas Cowboys that Sunday!